Once a heating or cooling solution is installed, smart consumers and businesses understand that they need to optimize performance over the life cycle of that system. This means designing and implementing a comprehensive service package. We also service plumbing, whether installed by us or someone else. If you’re not sure, then contact us directly and we’ll assist. Check out our 3 point troubleshooting checklist at the bottom of the page first. We will keep your system running at top notch performance. Proper maintenance will ensure that your system keeps performing at the highest high level. 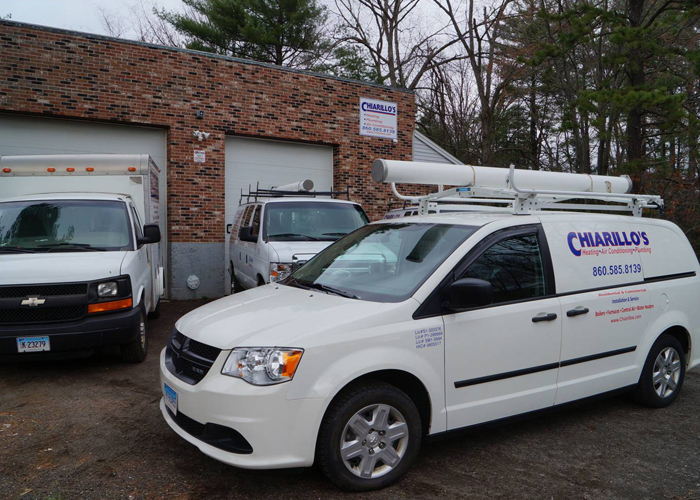 When your heating or cooling unit is maintained on one of Chiarillos’ Premier Service Plans, we’ll perform the appropriate cleaning and tune-ups on our yearly service calls to ensure that your system remains optimized. The bottom line is that preventative maintenance saves you money. And the best part is that we will remind you when it’s time so that you don’t miss your yearly review. Check to see that there is power going to the system. Ensure the stair switch is in the “on” position. Check the electrical panel – are any circuit breakers tripped? Do you have oil in the tank? Does your thermostat take batteries – are they in working order? Is the thermostat in the proper heating or cooling position? Have you tried the reset button – If you do use the reset button and it will not continue to run you need to contact us. If there is water leaking from a broken pipe first try the shut off at the sink or toilet. If there is no valve, it doesn’t work or you have city water – shut off the main valve, which is usually located at front of the house in your basement. We offer maintenance plans that will keep your system running at top notch performance. Proper maintenance will ensure that your system keeps performing at the highest high level.